New Delhi, Oct 2 (IANS) Prime Minister Narendra Modi on Monday paid tribute to Lal Bahadur Shastri on his 113th birth anniversary. “My respects to Shastri ji, who inspired farmers, jawans and gave the nation able leadership. Remembering Lal Bahadur Shastri ji on his Jayanti,” Modi tweeted along with a video. 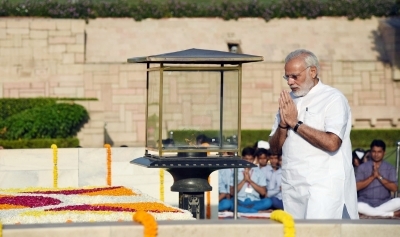 He also visited Vijay Ghat and paid floral tribute to the former Prime Minister. Shastri was born to Sharada Prasad and Ramdulari Devi in Uttar Pradesh’s Varanasi on October 2, 1904. On January 11, 1966, he took his last breath in Tashkent, Uzbekistan, the day after signing the Tashkent Declaration, reportedly due to cardiac arrest. He was the first person to be posthumously awarded the Bharat Ratna, India’s highest civilian award.